FLASHING A CUSTOM ROM MAY BRICK YOUR DEVICE, SO IT IS STRONGLY RECOMMENDED BEFORE FLASHING ANY CUSTOM ROM, DO A FULL ROM BACKUP.IF YOU WISH FLASH CUSTOM ROM WITHOUT ANY BACKUP, I AM NOT RESPONSIBLE FOR ANYTHING WRONG.SO BE CAREFUL. AJIT GURAYA FOR DEVELOPING ResurrectionRemix-M 5.6.7 FOR MTK6582. AND THANKS TO: FERHUNG,FIRE 855,HYPERION70,DIPARTH SHAH,MINH QUOC,KARIM GAHGAH,ANIRUDHYA ADHIKARI,TEAM ROGER THAT,REQUIRED BLOBS. 3) And oviously a Rooted Micromax Unit 2 with a Custom recovery install. 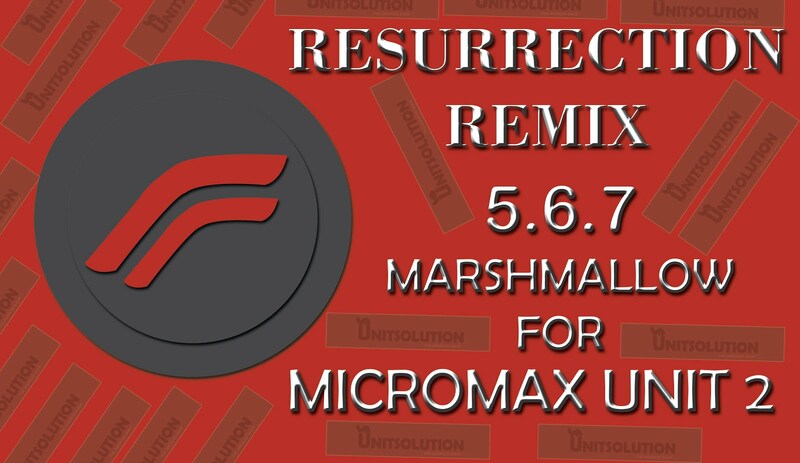 FIRST OF ALL DOWNLOAD BOTH OF ResurrectionRemix-M 5.6.7..ZIP AND PROPER GAPPS PACKAGE AND COPY IT TO YOUR SD CARD. 1)DO A FACTORY DATA RESET , THEN CLEAN CATCH AND DELVIC CATCH. 3) NOW AGAIN CLEAN ONLY DELVIC CATCH.AND REBOOT YOUR PHONE..
…###.THIS ROM WAS STABLE VERSION, I DO NOT FOUND ANY BUGS IN THIS ROM. THANKS FOR READING MY POST…..